What do you give for a memorable birthday present, to truly mark the moment? Well, there’s no one right answer. But for Rob, who’s birthday is today, it had to be an experience. He always says he values experience more than things, and anyway, as most people have sorted out by 50, there are only so many things a person needs. He’s not one to collect status symbols, or to collect anything, for that matter. ~11:00 AM reservation for tandem skydives…yes, we’re taking the plunge! Happy Birthday to Rob, my one and only. And may this be the beginning of the best years of your life! Wow! That is super cool – pics and a write up please. Thanks for the birthday wish. It was an amazing experience to skydive, and all the more memorable for doing it together! Happy Birthday Rob, you always did walk a different path, and I always was amazed at your insight for one so young. I am so happy that Sheila planned a memorable day for you. I jumped out of a perfectly good airplane once. Hope your experience was much better than mine. Wishing you and Sheila all the best. Thanks for stopping by. It was an amazing experience to free fall and to see the land below after the chute opened! Thanks for the birthday wishes! It was a memorable day! Our jump experience was mostly good…surreal, but good! 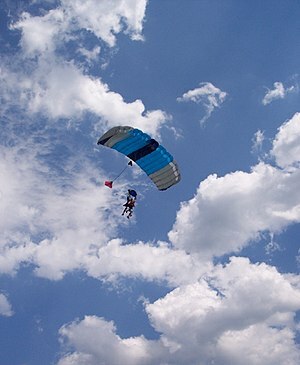 I don’t know if I could have gone through with it if I hadn’t been attached to the tandem guy who jumped with me. The few seconds of standing in front of the open door of the plane were the most unnerving, but once I was out it was amazing. Take care! I enjoy seeing your fb posts. Wow!! What a day of “Experiences” – very impressive!! ~ Way to go Sheila!! Thanks for sharing and Happy 50th Birthday, Rob! Thanks for the birthday wishes! I was happy that he didn’t back out when he saw the diving school! I think he was afraid I was after the insurance money, but then he realized I was jumping too,so he knew it wasn’t a plot!